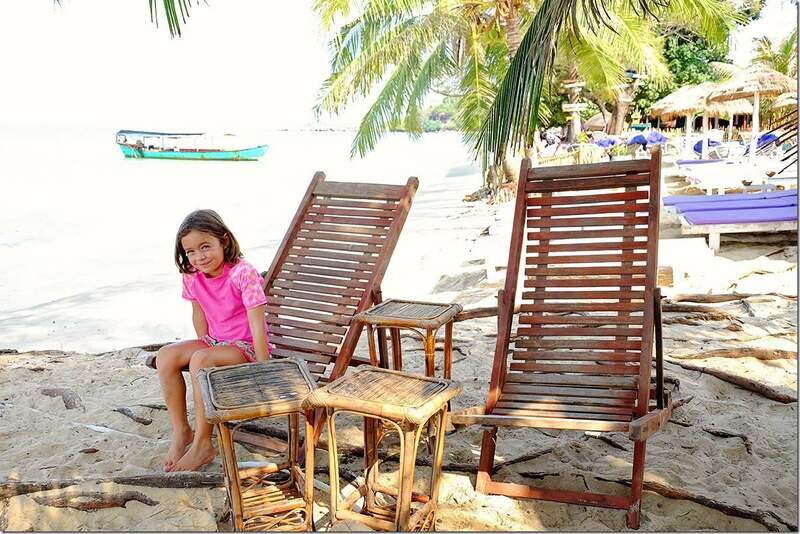 Otres Beach Cambodia is one of the most popular beaches in Cambodia! That is why we ventured out to this side of the country, to check it out and get a closer feel for what is in store. Haha… There is a lot in store here when you take a closer look. Let’s put it this way, apart from the usual relaxing massages and vegging out, you can also find some interesting things to eat here at Otres Beach and more. Did I get you interested? Well, scroll down to read more then. 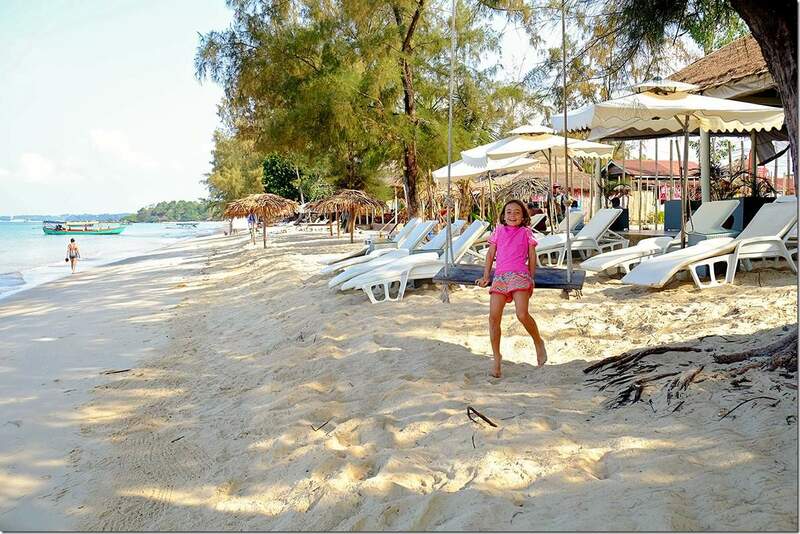 People always search if they should go to Otres Beach or Sihanoukville. Then there is a choice between Otres Beach 1 or Otres Beach 2. Too many decisions? I think so too. We decided to spend our short break at the famous Otres Beach 1. Today’s story will give you a bit of a look at what we did, and hopefully, we will make your choice a little bit easier. 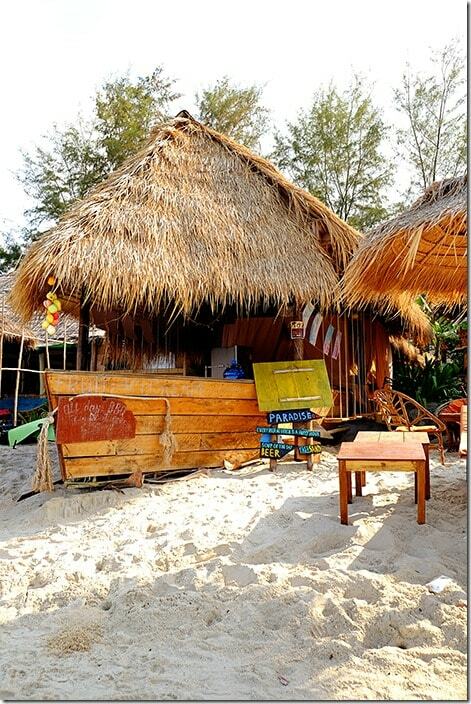 If you are searching for the best beaches in Cambodia, you must also check out Koh Rong Samloem Island. I am always drawn to staying closer to the water if it is possible. Water has a more calming effect on my soul and relaxation seems to come more naturally for me. Soft sand underneath my toes, cocktail in hand while lazing on the beach bed and our kids playing right in front of me. That is pretty much what I look forward to when we go away and stay at the islands or beaches. I know that my gorgeous wife feels pretty much the same. For her though, it is very important to hear the sound of the water to sleep to. Well, some of the things on our expectation list of Otres Beach 1 were ticked off and more, but some definitely were far from perfect. 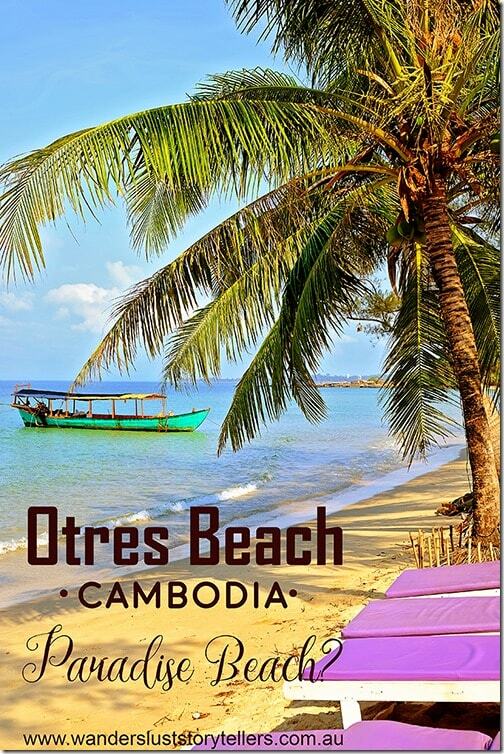 Otres Beach or Sihanoukville? To us, the choice here was very simple. 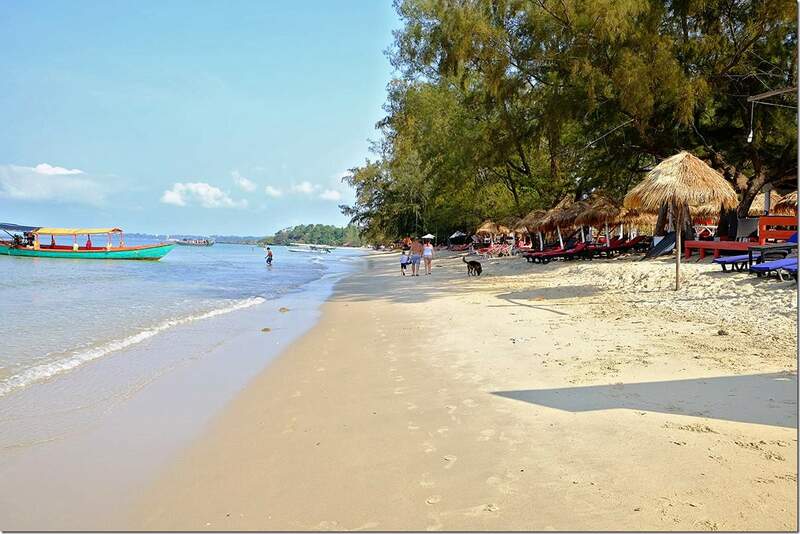 Sihanoukville is the party capital of the area. If you are ready to party like there is no tomorrow, be my guest and take this option. It will definitely satisfy your senses like nowhere else. Plenty of bars with a large selection of Amsterdam-like goodies will take your breath and mind away if you please. I would probably say, if you are going for a part-time as a single, or for a couples getaway, then this is the option for you. Otres Beach 1 or Otres Beach 2? Otres 2 is probably the nicest area to stay at. If you are searching for a more peaceful stay and a bit of bliss, this part of the beach will have a few nicer and bigger resorts to stay at. Be prepared to pay a little bit more for the accommodation. Being just a little bit further from the action of the bars could be a plus when you are here on your holidays. On our holiday we chose to stay at Otres Beach 1. We wanted to get a better feel on what is going on in the area and I am glad that we did. We were here in the quiet season, so it was not too crowded. You might need to take this into consideration if you follow in our footsteps. Ok, choices of which beach aside, we arrived at Otres Beach 1. Ok, so you have probably picked up in the introduction that I have mentioned Amsterdam-like goodies. 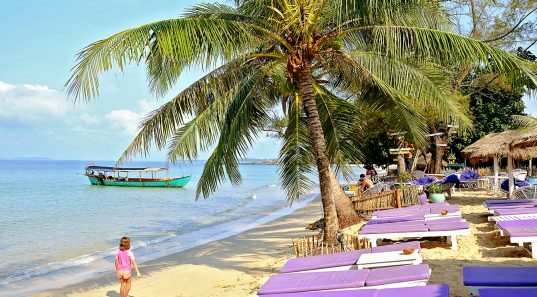 Whether you choose Otres Beach or Sihanoukville, you will find yourself surrounded by signs like Happy Pizza, Happy Smoke or Great Snacks! Obviously, we did not indulge in what was on offer on the extensive menus, but for those of you that don’t mind a mind-altering cuisine, then you will be thoroughly satisfied here. Yes, this whole area is famous for being a pretty Hippie hang out, full of backpackers and young and old peace loving travellers. Yes, it is not your best place for families, but we did not feel unsafe or have any discomfort when we stayed here. We were not the only family on vacation in Otres Beach either. Plenty of kids were running around on the beach in front of their parents as well. 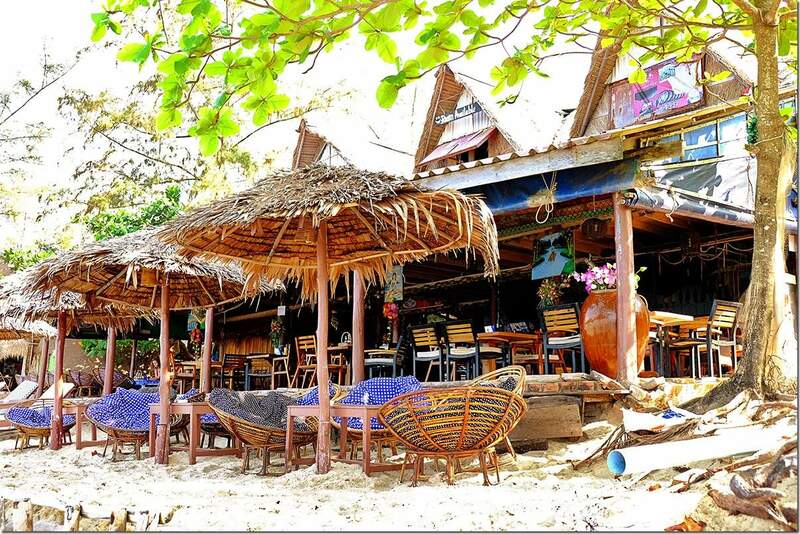 I think the place felt so chilled out because of all the relaxation going on at Cambodia Otres Beach 1. The beach, however small, is lined with countless bars and restaurants to suit all those interested. 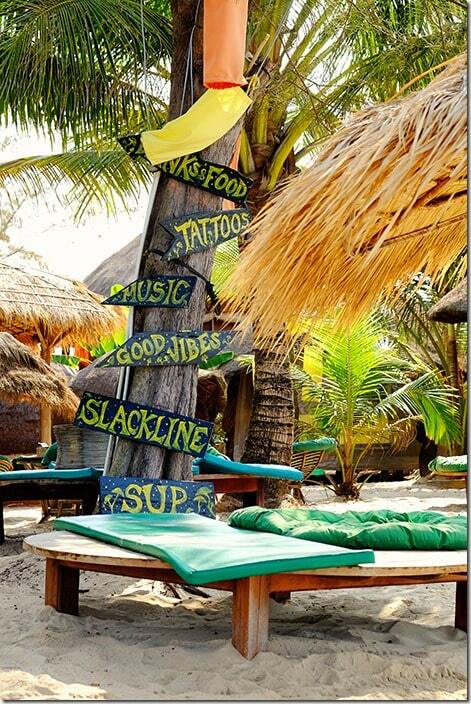 We chose to stay at the Good Times Resort just across the road from the beachside bars. It was a nice place to stay and one of the only ones that were suitable for a family of 4. We stayed in one room, but it was enough for what we needed. Extra pillows for my pregnant wife and fans to cool her down were provided by the friendly staff. The room itself had air-con, bathroom and all necessities. Buffet breakfast included. For more details scroll down to the bottom of this story. Otres Beach 1 is a pretty underdeveloped looking place if you look at it. There is no luxury in sight. 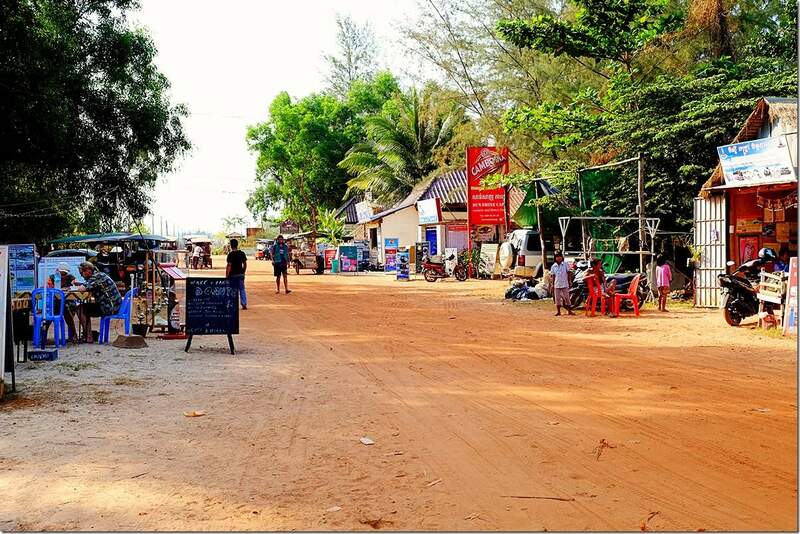 Walking the one street that cuts through from Sihanoukville to Otres Beach 2, all you see is red dirt and roughly put up shacks. Some of them are the fronts for dodgy looking shops, but the majority are the back doors for the beachfront accommodation, bars and restaurants. Not a pretty sight, but it looks like nobody is really bothered with that. I think a lot of people come here simply for a good time, not a family relaxing holiday. Once on the beach, you quickly forget the dusty red road behind you. Countless beach beds are calling your name. I think we spent at least 4 to 5 hours at the time vegging out, sipping on virgin cocktails, whilst our kids indulge in the freshly made fruity shakes. Wifi available, so you can stay in contact with the world or if you want to put a selfie on your facebook. I thoroughly enjoyed myself here at Cambodia Otres Beach. Jolene and the kids did go for a walk along the beach to stretch the legs and snap few pics. You learn very quickly that once again people do not seem to mind how run down the building are. Dodgy looking shacks are everywhere, rubbish here and there poking out from the walkaways are unavoidable from noticing. However, all of this is nestled in between palm trees lining the entire stretch of the beach, creating some sort of harmony in a way. I guess, what else do you need, when you have a beach with picturesque views from your primitive beach bungalow, through the palm trees. Yup, doesn’t sound too bad hey? Well, unless you want air-con. Then just hope over across the road. Whilst you are chilling out on the beach, there is quite a lot of choices of things to do. 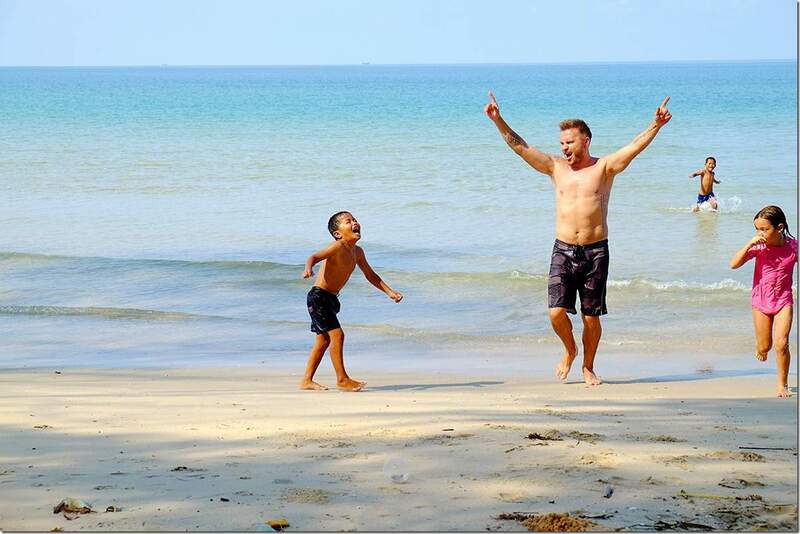 We have chosen to spend our time swimming and playing around with the kids in the shallow waters. Even the local kids joined in on the fun. Lily was a little shy at first, but quickly warmed up and we all had a great time being silly. After walking and playing around in the water you can choose from one of the massage places and get your already relaxed body a bit more of a de-stressing rub. I think our kids got hooked on the massages on our trip through Cambodia. Everywhere we went, both Katie-Lee and Lily were more than keen to jump in on the usually sporadic activity. And why not, when you are paying only a few dollars for it. One of the best ways to unwind, I reckon. There are plenty of women walking up and down the beach offering massages as well and I got to say that it got a little bit annoying. One lady kept on coming back to us every round, who we started to ignore at the end. How many times can you say no politely? My gorgeous wife already had our private masseuse attending to her needs right at the beach chair. We did say yes a few times to one lady though. 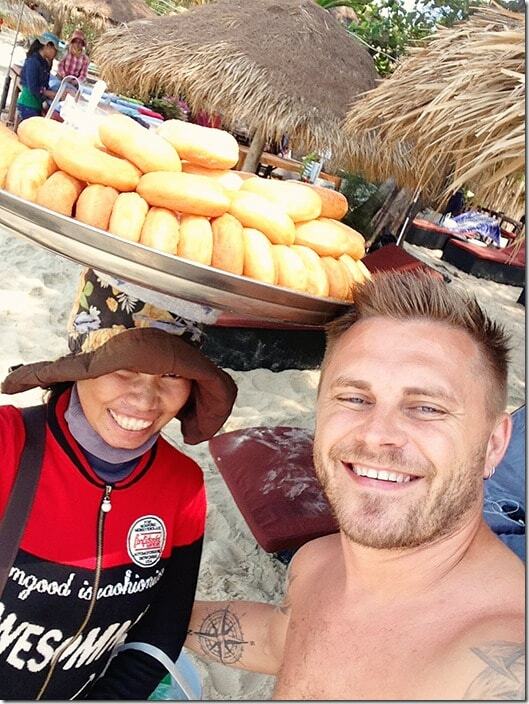 The doughnut lady! Massive selection of tropical fruits, sunglasses or handmade bracelets etc. However, what stole our hearts away was the glorious and the most delicious doughnuts! Did I say already, that you have never had a doughnut like this before? Yes, just said it twice. Can’t get any fresher than these. Straight from the bakery and sugared right in front of us. Cannot argue with a pregnant woman! There are plenty of other things to do off the coast. Diving seems to be pretty popular in this area as well. You can take a ride on the glass bottom boat. That way you can check out what is going on below without getting wet, or you can take a boat to one of the nearby islands of Kaoh Tres and Kaoh Chanloh, or venture out to Koh Ta Kiev and spend a day there. And lastly, let’s talk about food. 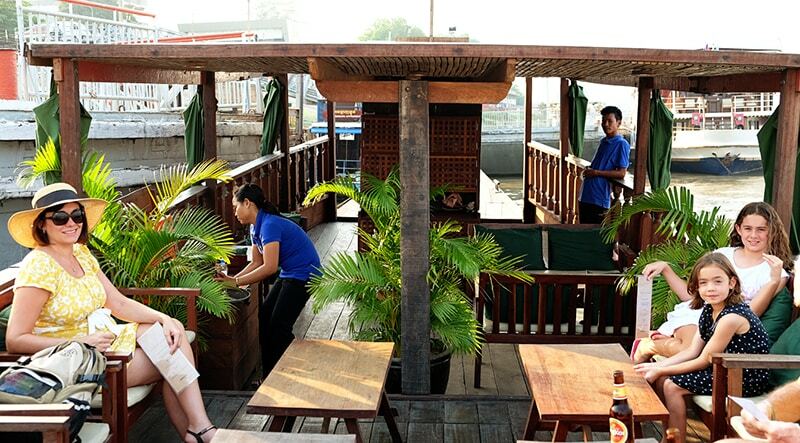 We did eat at one of the most popular spots on the Cambodia Otres Beach. Yup, it is Papa Pippo Otres Beach. I met the owner or Papa Pippo and got to say, he is a very cool dude. We had some yummy pizzas all around and finished with delicious desserts. 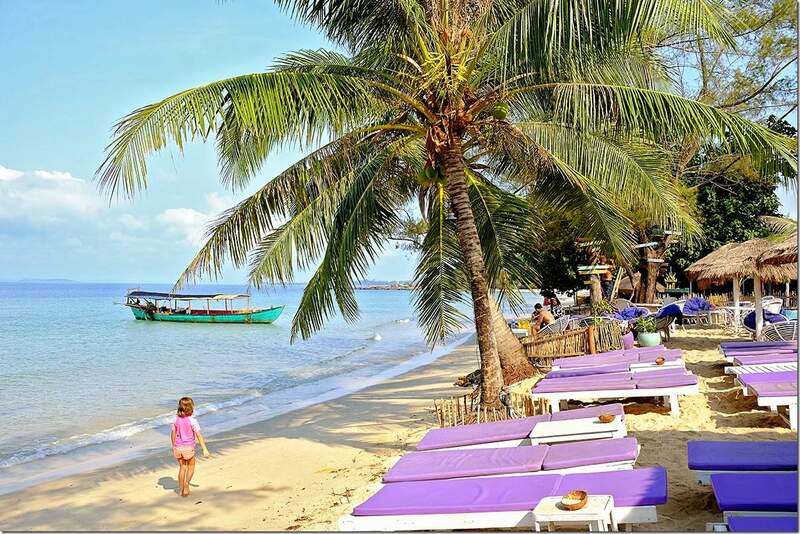 Well, whether it is relaxation in between the palm trees on the beach with good vibes and music or a happy pizza that you are chasing, it is all here in Cambodia Otres Beach! 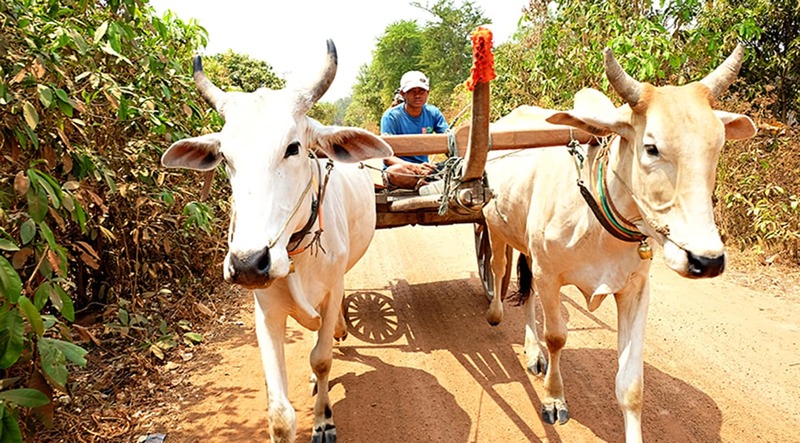 Call it a little Amsterdam of Cambodia if you like, I think it is worth to check out, even if you are not that way inclined. This choice I leave to you. – for more details and prices follow this link. Good Times Resort is the Cambodia beach resort that we stayed in. It was a bit crowded in one room with the kids, but it was clean and tidy. As I mentioned before, we had all the essentials in the room, including air-con and fans, even got extra pillows from the friendly staff. Buffet breakfast was included! 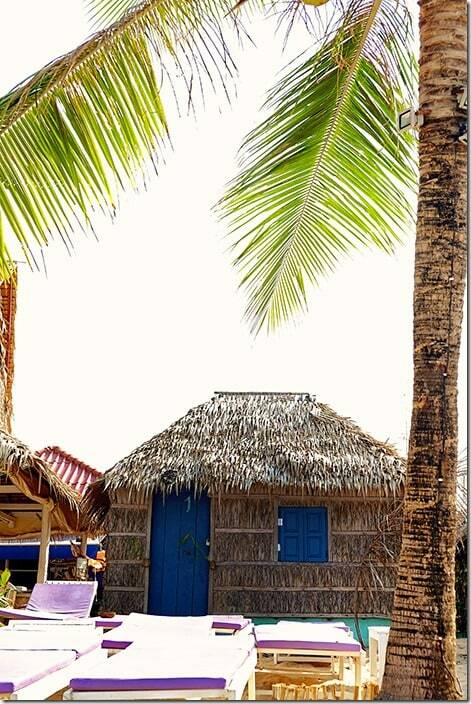 There are numerous Otres Beach bungalows available in the area. Majority of those are pretty basic and looks like some are share accommodations too. If you are looking for a more relaxing stay, I would suggest booking at Good Times Resort instead. During the peak season, the beachside places would be even noisier and crowded. I will leave that choice to you. 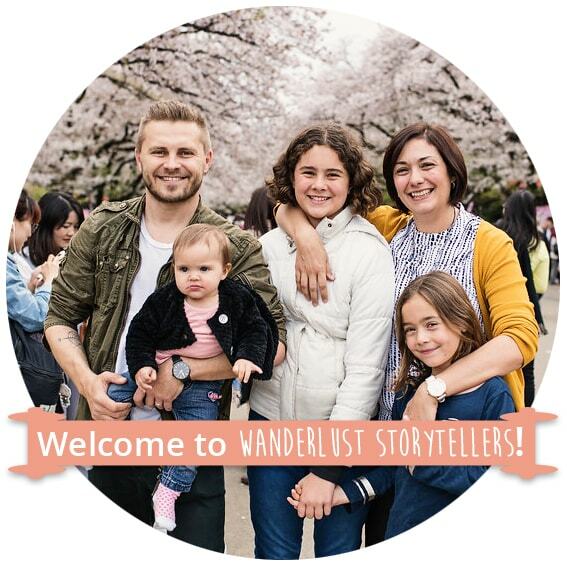 If you are travelling with kids, you might like to check out this guide to some great accommodation options for families. –for more details and to compare the prices follow this link. This Otres 2 Accommodation is a 3 Star hotel. Only a short walk from Otres beach, this hotel has a private pool and a kids pool too; 24hr room service and a coffee bar. Just a little more than the standard that the Otres 1 has to offer. The Secret Garden at Otres Beach has a private stretch of the beach and it is a great base to check out the surrounding area as well. – for more details and to compare the prices follow this link. Tamu hotel is probably the fanciest one on offer in Otres 2. Rooms have all the bells and whistles, including modern decor, air-con and room service. Romantic setting, pool and an Asian cuisine restaurant, all together this would be a number one choice for that little bit more upper-class stay whilst on your holiday. This hotel provides an airport shuttle service and can help with organising the local attractions or tours.